Sing Your Heart Out (SYHO) are launching their singing workshops in Sheringham. Tickets are £2.50 (under 16s go free). For more information please call 01263 860305. The Purfleet Trust invites you to join them at upcycling painting classes, every four weeks starting Sat 5th March from 11.00am-2.00pm at the Olive Branch, Centre point, Fairstead, King’s Lynn. Forward Day Centre are looking for unwanted teapots, science equipment, a lockable metal cabinet, hand tools, carpentry tools and gardening equipment. 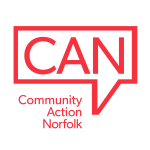 Community Action Norfolk and Momentum (Norfolk) are working with Norfolk County Council to ensure the Voluntary Community and Social Enterprise (VCSE) sector effectively engage in Norfolk County Council's Re-imagining programme and budget proposals. We will be publishing more details shortly but in the meantime please put these dates in your diary.